(NewsUSA) - The beginning of a new year is an opportunity for a fresh start for your home. One easy change that will make a big impact is a lighting update. Simply changing a fixture - a chandelier, a few pendants or even just a table lamp - can give a room a whole new look. So whether you are considering a minor update or a major renovation, stay on top of the latest lighting trends with a few tips from the American Lighting Association (ALA). "One of today's popular design trends encourages individuals to create unique lighting designs by mixing and matching their favorite fixtures within the same space," says Jennifer Kis, director of marketing communications for Progress Lighting. "There is no need to feel limited by fixtures, or even finishes, in one particular collection. Coordinating complementary pieces creates a cohesive feel to the home, while also reinforcing your design style." Lighting manufacturers are making it easier for homeowners to select fixtures that work well together by offering collections that feature details and finishes that are complementary to a range of fixture families. Look outside for inspiration. Using interior design elements in outdoor spaces has been popular in recent years. But gaining popularity lately is the idea of incorporating exterior fixtures with inside décor. "We have seen a lot of creative ways designers are using a variety of exterior lanterns inside," says Kis. "Nature-inspired elements and outdoor wall sconces or hanging lanterns that are traditionally used to enhance curb appeal can also be ideal when incorporated into interior design schemes within the home." For versatility and compatibility, opt for pendants. Available in a seemingly infinite array of shapes, colors, sizes, finishes and materials, pendants are more popular than ever. These adaptable fixtures can be hung in groupings of two, three, four or more, depending on a particular space and need. 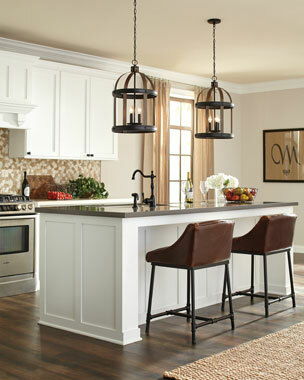 Pendants can serve as overall task or ambient lighting, as well as add visual interest and beauty to the overall décor. For more information, and to find a list of local ALA-member lighting showrooms where you can see the latest fixture styles and talk with a professional lightingconsultant, go online to americanlightingassoc.com.